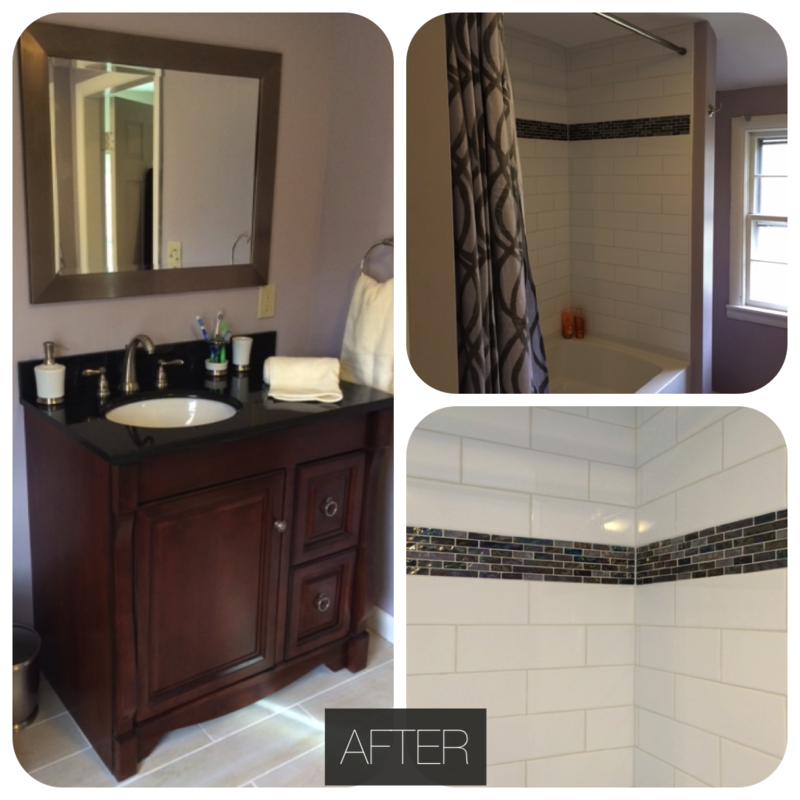 When you buy a fixer upper you imagine that with a little sweat equity you will literally transform the entire place into a beautiful home – just like new! Maybe that’s true if you hire a contractor and drop a couple hundred grand, or if you get on one of those HGTV shows like Property Brothers or Kitchen Crashers (believe me I’ve applied like 14 times). But if you have a few thousand dollars and only the moonlight hours to do the work yourself – with a 1 year old in tow – things turn out a little differently. I guess that’s the rub of living in an old house. No matter how many times you meticulously tape, scrape and paint the baseboards they will still look chipped and grimy. No matter how many times you mud, tape and paint the walls, they will still look uneven and bumpy. 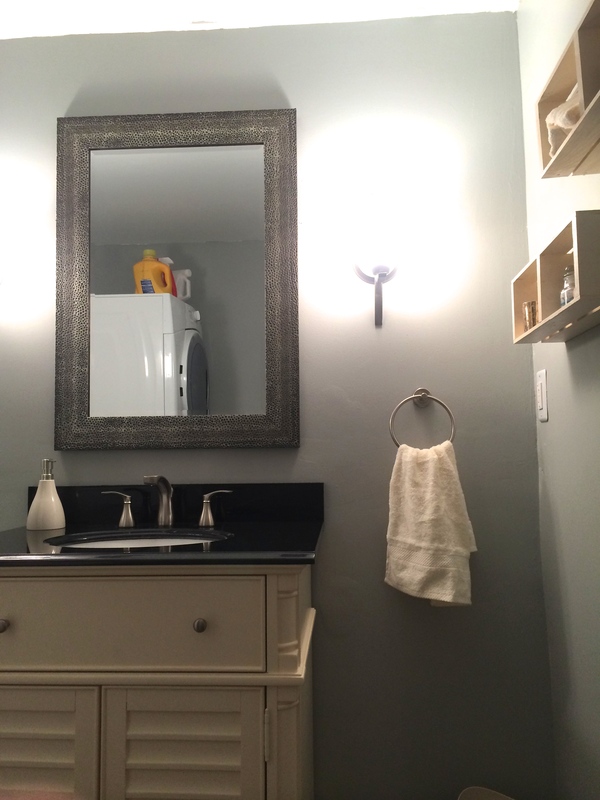 And no matter how many times you make your husband re-hang the mirror, it will still look off center because the walls of the old house are literally NOT STRAIGHT. For a person with even mild OCD, this is devastating. 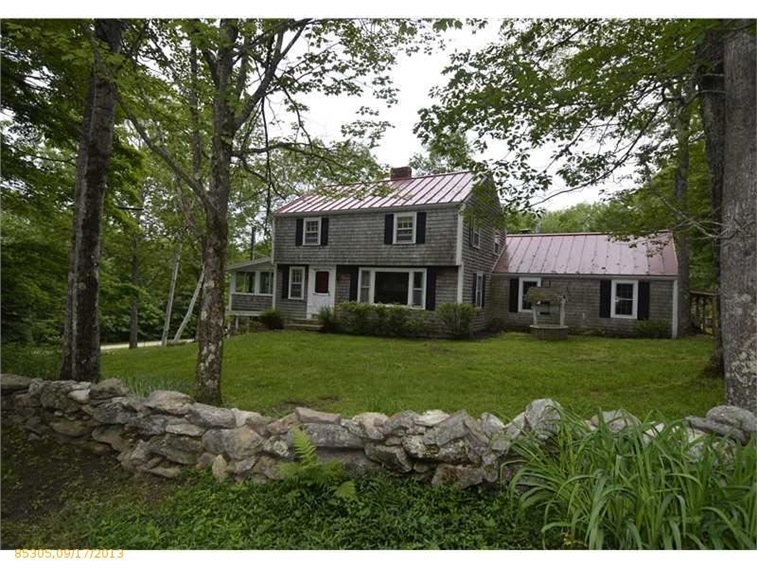 On the bright side, you don’t have to clean as often because a little dirt is part of the “charming old farmhouse” aesthetic. At least that’s what I tell myself. But anyway, I lured you into this post with a “Before and After” title so I guess it’s time to deliver. 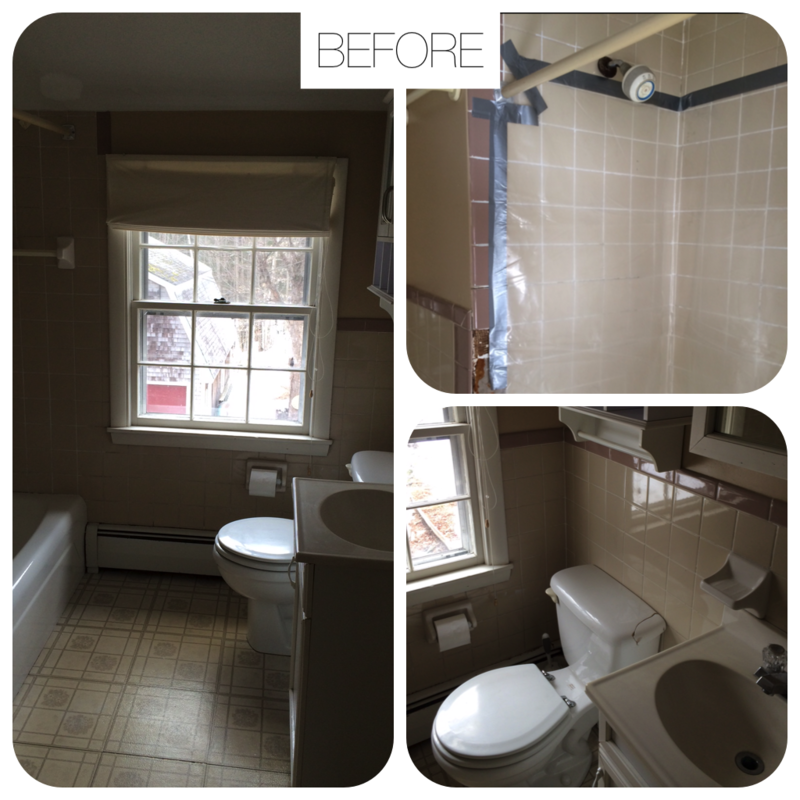 Here’s a walkthrough of the 5 rooms we’ve renovated so far. Yea, I know. SO GROSS. But a couple weeks and a couple grand (ahem, 7k) later – we ended up with this. We completely gutted everything down to the studs. We even had to replace some of the studs. 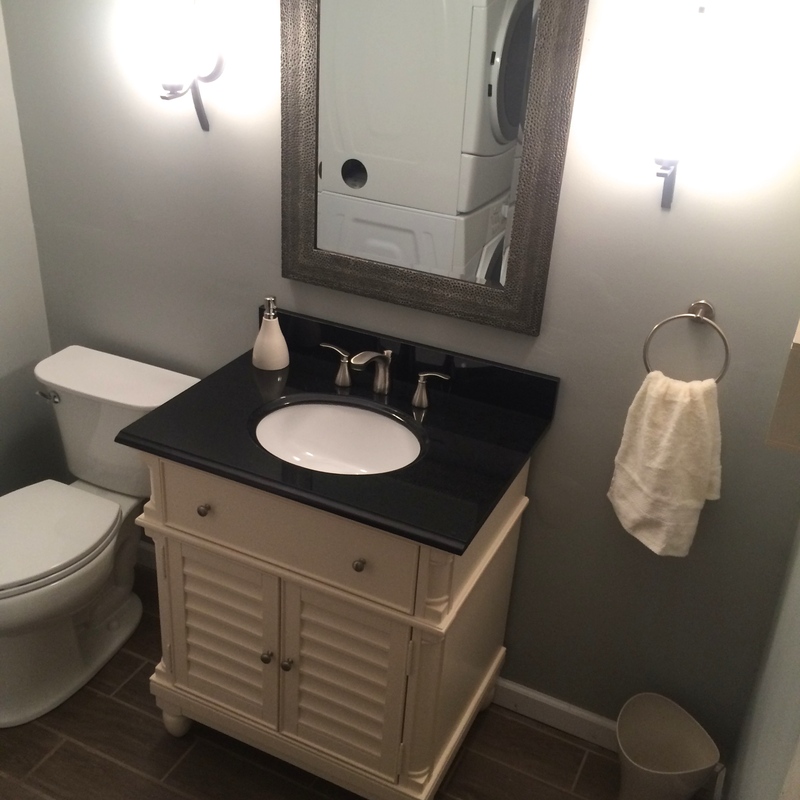 For those who are interested the vanity is from Lowes, granite top is pre-cut from Home Depot, and the shower curtain is from West Elm. 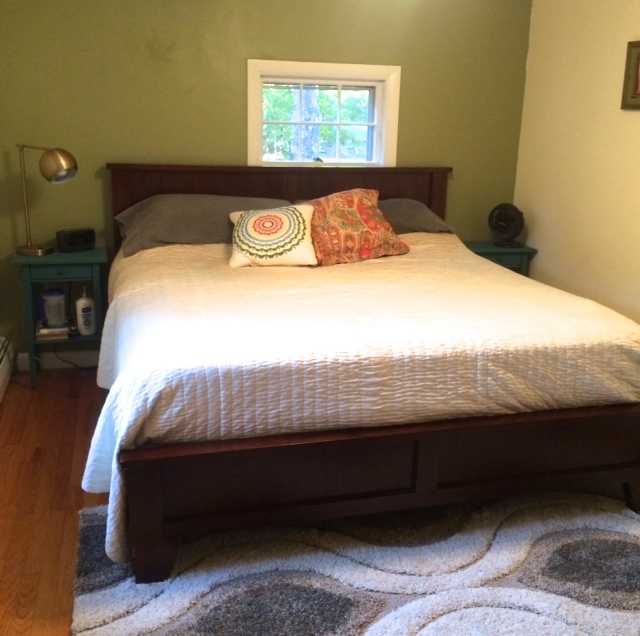 Next up was the master bedroom. 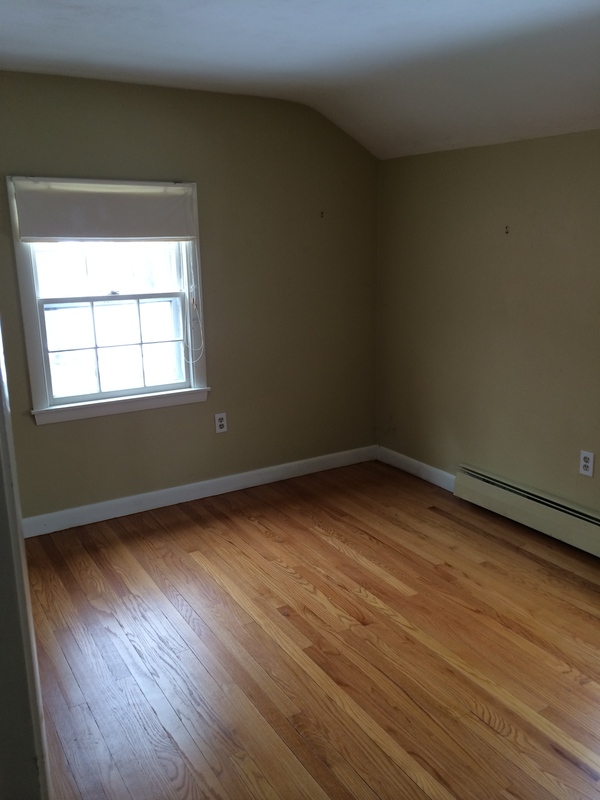 Here’s what it looked like in the listing photos before we bought the house – it definitely didn’t look like this when we moved in – ha! We actually did a lot more work to this room than can be shown in pictures. We took out a neighboring 4th bedroom, and knocked out a wall to expand this one slightly. 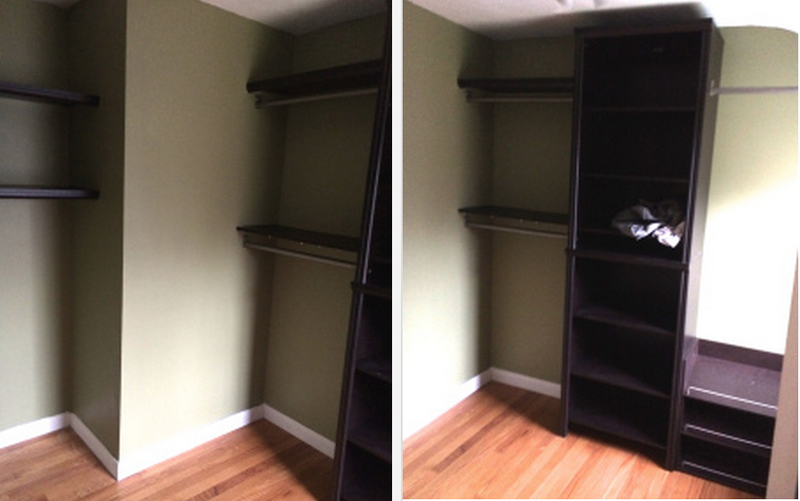 Than we added a walk-in closet and filled it with custom shelving. We did the same thing at our last house, too – we just can’t function without a big closet. 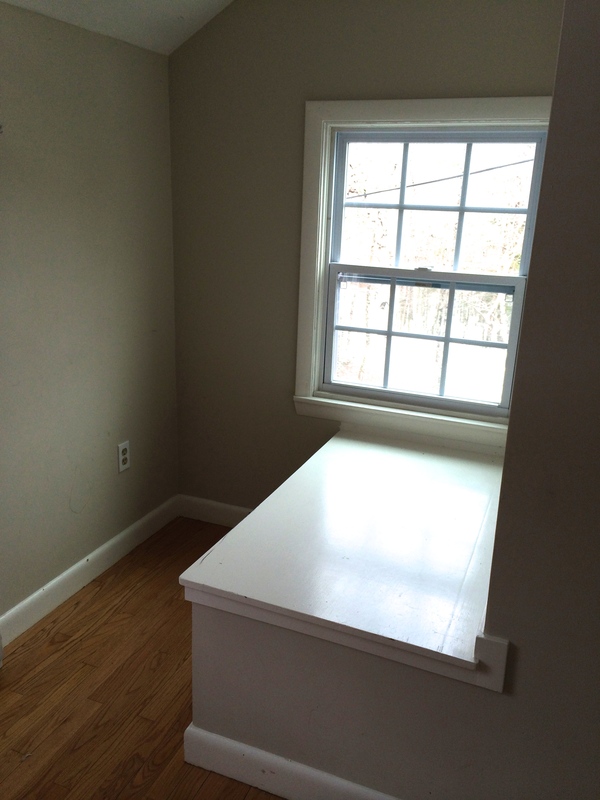 We also painted the room cream, and added a green accent wall. 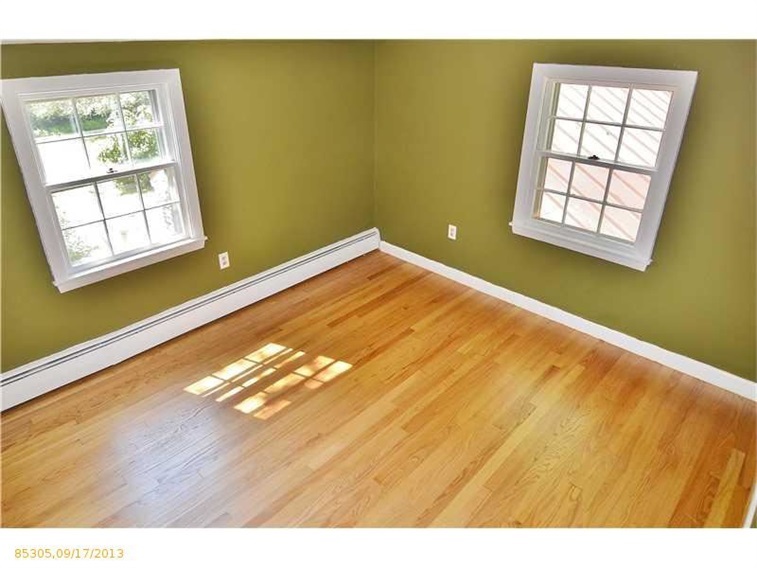 The green in the image above is totally photo shopped by the listing agent, which was a smart move because in real life it was a dark forest green that made the room feel even smaller than it actually is, which is really small. 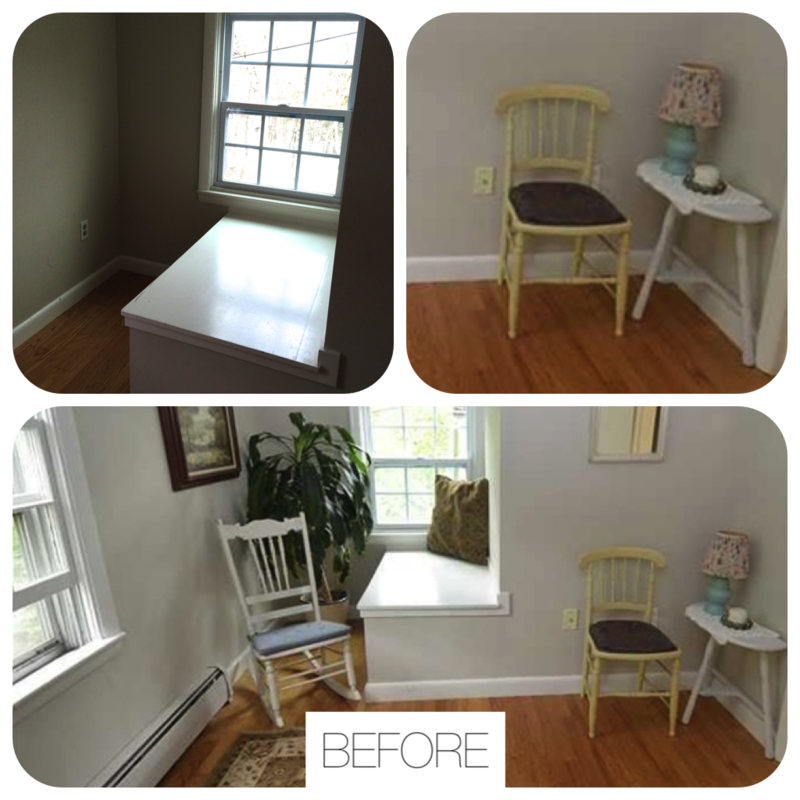 Oh and we replaced the window and added overhead lighting in the closet and the bedroom – this house had NO overhead lighting in any room when we moved in – yikes! 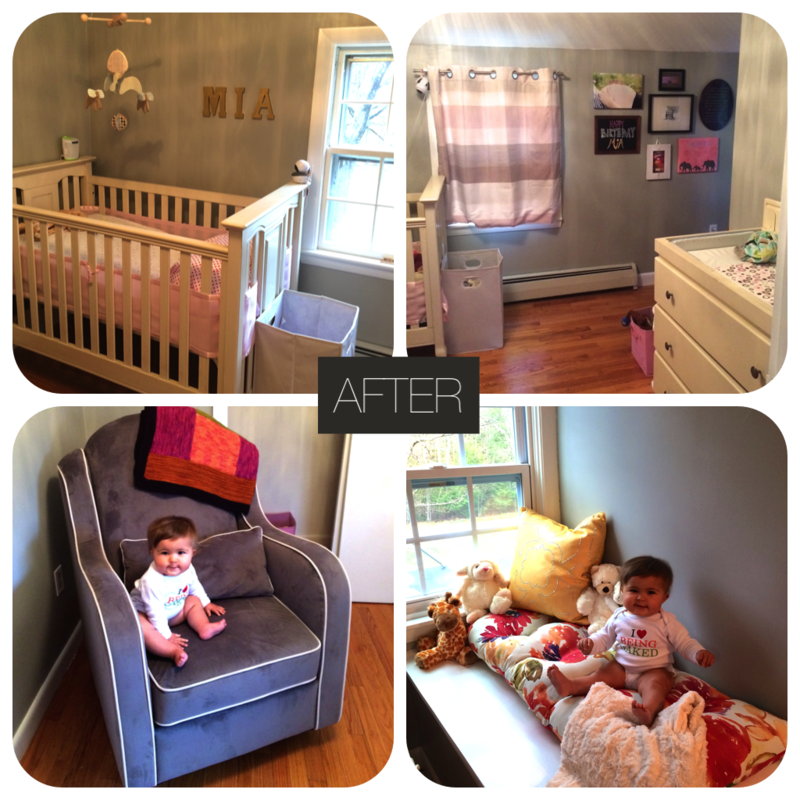 Next up was a complete makeover on Mia’s room. When we moved in it was pretty much empty – painted a dull gray with lots of cobwebs and dirty, smudgy walls. The walls in this house are plaster so before painting each room we had to scrape all the walls and fill a bazillion cracks. Then mud them back over, sand and prime – and then paint. A huge hassle. We also had to repaint some of the ceilings where some water damage (that has since been repaired) caused them to stain. Unfortunately I don’t have many pictures of Mia’s room before we re-did it, but here’s one. 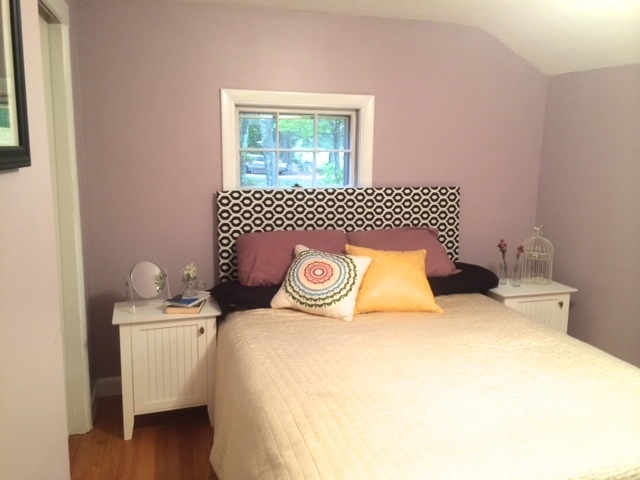 To update Mia’s room we repainted everything, including all of the trim (what a pain that is), and added a crystal overhead light – total splurge! The rest was just furniture and decorating. The crib is from Babies R Us but they discontinued the color, similar here; glider is from Babyletto, and ceiling light (not pictured) is from Wayfair. And here’s what it looks like now. I can’t give you sources for any of the stuff in this room because it is literally all second hand or craigslist finds from the nightstands ($20 for the pair) to the bed frame (free) to the mirror (free), etc. The sheets and pillows are new, from Target – in case you were worrying that I bought those on Craigslist too. I like a bargain but I draw the line at sheets. 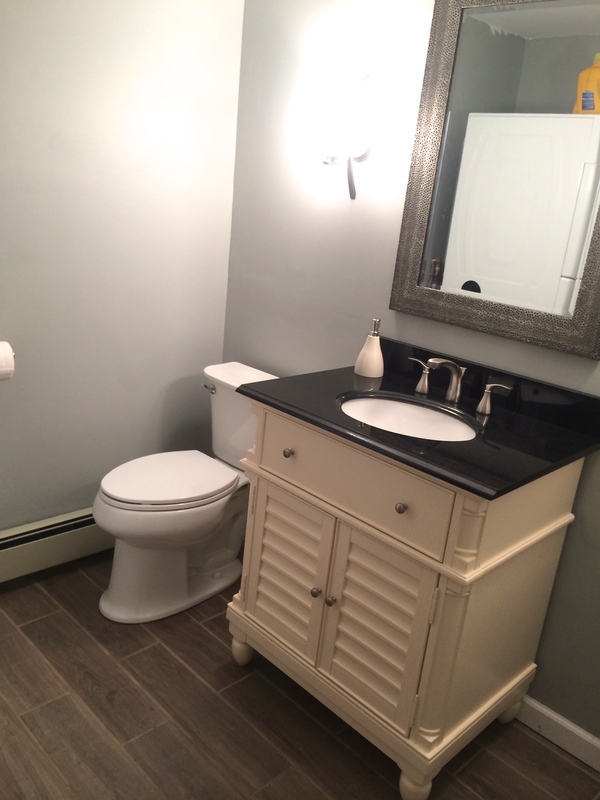 And finally we have the downstairs bathroom which I revealed a couple weeks ago on the blog, so I’ll just throw up some before and after pictures to remind you of the horror that it once was. 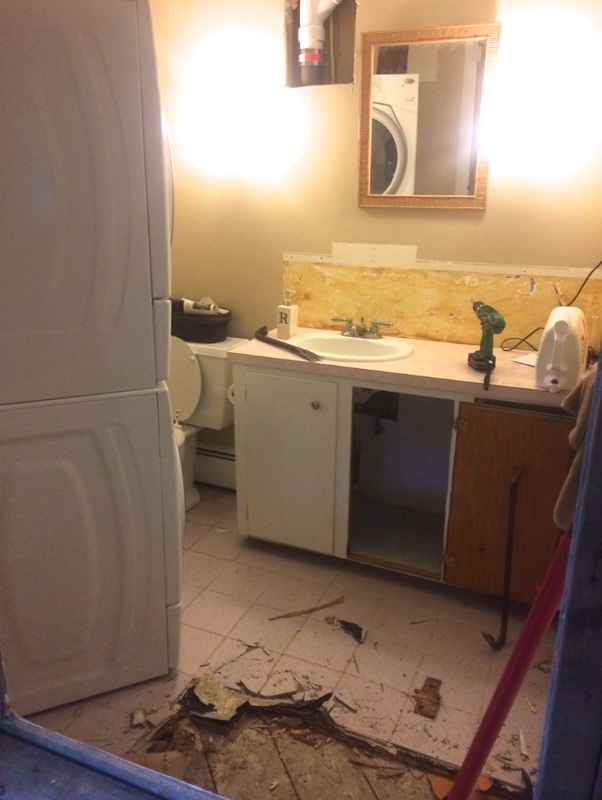 Even our close friends who I know were doing their best to encourage me that the house wasn’t SO BAD when we bought it – said this bathroom had to go. 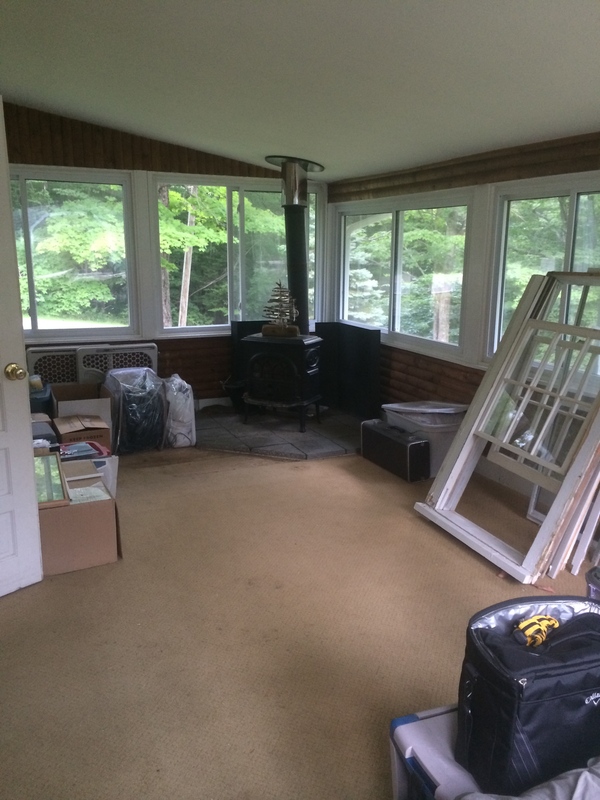 The next project in the works is the sunporch…which we weren’t planning on updating this year – but thanks to an old commercial freezer in the basement that I was able to sell on Craigslist, we scored the cash we needed for a new floor and some fresh paint. Here’s what it looks like now, hopefully I’ll have an after shot in the next month or so! After we finish the sunporch it’s on to the kitchen and formal living room. But don’t hold your breath on those, we need to win the lottery first. We are certainly NOT interior decorators (I wish) but we have started to turn this house into a home, and it feels even more special since we’ve done most of it with our own hands. Goin’ for that sweat equity!